Remove the buttons from the dress shirt and sew the black buttons in their place. Use the black floss to embroider spider legs around each buttonhole (it helps to button the shirt to figure out where to place the legs). 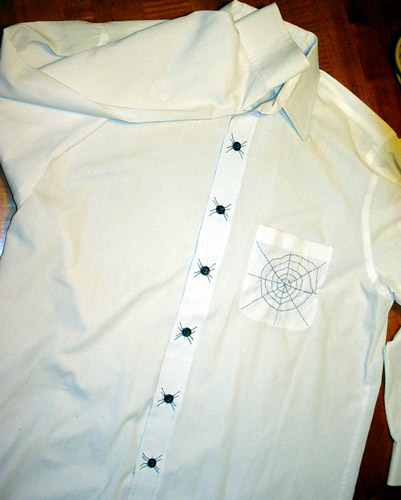 Use the grey floss to embroider a spiderweb on the pocket (or, if the shirt doesn’t have a pocket, on a corner of the collar): Stitch intersecting straight lines and then stitch a widening spiral. Here are some easy instructions if you aren’t sure what you’re doing. If desired, stitch an extra button to the web and embroider legs on it as well.